The gradient function is a vector quantity, the presence of which is associated with the definition of partial derivatives of the function. The direction of the gradient indicates the path of speedy growth of the function from one point to another scalar field. To solve the problem on the gradient function uses the techniques of differential calculus, namely the finding of partial derivatives of the first order in three variables. This assumes that the function and all its partial derivatives have the property of continuity in the function definition. The gradient is a vector whose direction indicates the direction of fastest increase of the function F. on the graph are chosen at two points M0 and M1, which are the ends of the vector. The gradient magnitude is equal to the rate of increase of the function from point M0 to point M1. The function is differentiable at all points of this vector, thus the vector's projections on the coordinate axes are all its partial derivatives. Then the formula of the gradient as follows:grad = (∂F/∂x)•i + (∂F/∂y)•j + (∂F/∂z)•k, where i, j, k coordinates of the unit vector. In other words, the gradient function is a vector, whose coordinates are the partial derivatives grad F = (∂F/∂x, ∂F/∂y, ∂F/∂z). Example1.Let function F = sin(x•z2)/y. You want to find the gradient at the point (π/6, 1/4, 1). Solution.Determine partial derivatives for each variable: F CH = 1/y•cos(x•z2)•z2;F _y = sin(x•z2)•(-1)•1/(y2);F _z = 1/y•cos(x•z2)•2•x•z. Substitute the known values of the coordinates of a point:F _x = 4•cos(π/6) = 2•√3; F _y = sin(π/6)•(-1)•16 = -8; F _z = 4•cos(π/6)•2•π/6 = 2•π/√3. Apply the formula for the gradient function:grаd F = 2•√3•i – 8•j + 2•π/√3•k. Example 2.Find the coordinates of the gradient of the function F = y•arсtg (z/x) at the point (1, 2, 1). Solution.H f = 0•аrсtg (z/x) + y•(аrсtg(z/x))’h = y•1/(1 + (z/x)2)•(-z/x2) = -y•z/(x2•(1 + (z/x)2)) = -1;F _y = 1•аrсtg(z/x) = аrсtg 1 = π/4;F _z = 0•аrсtg(z/x) + y•(аrсtg(z/x))’_z = y•1/(1 + (z/x)2)•1/x = y/(x•(1 + (z/x)2)) = 1.grаd = (-1, π/4, 1). Physical meaning of derivative - rate of change of a function. The derivative of the function changes the coordinates is the rate of motion, the derivative of speed is acceleration. Thus, knowing the formula for change of coordinates of the body in space, you can find it velocity and acceleration in each coordinate space. Find the increment of the function: Δf = f(x0+Δx) - f(x0). Find the ratio of the increment function to increment of argument: Δf/Δx = (f(x0+Δx) - f(x0))/Δx. It is assumed that Δx tends to zero. 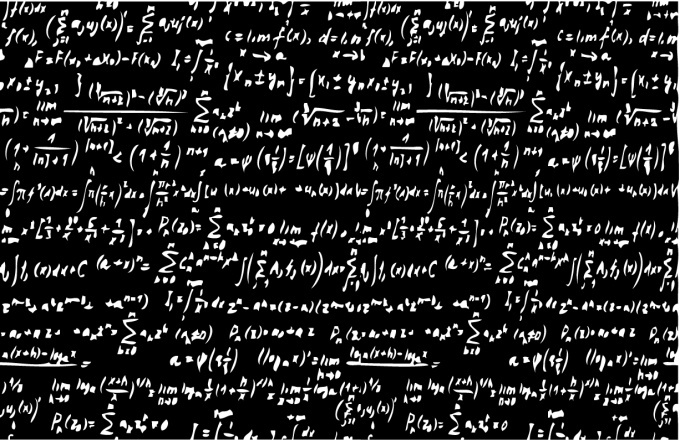 This will be the derivative of function at point x0. In practice, first find a General formula for the derivative function and then substitute the specific value of the argument. For example, f(x) = x^3 - 2x^2 + x + 1, we need to find the derivative at point x = 4. Find the derivative f(x) = 3x^2 - 2*2x + 1. Find the derivative of f'(4) = 3*4^2 - 4*4 + 1 = 48 - 16 + 1 = 33. The derivative of a constant is zero. 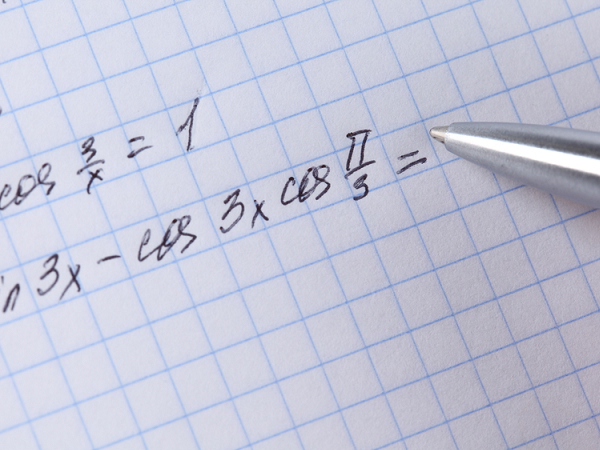 For basic functions, there are calculation formula of the derivative. Derivative of function - basic element differential calculus, which is the result of applying any operation to differentiation of the original function. Function name comes from the word "made", i.e. formed from another quantity. 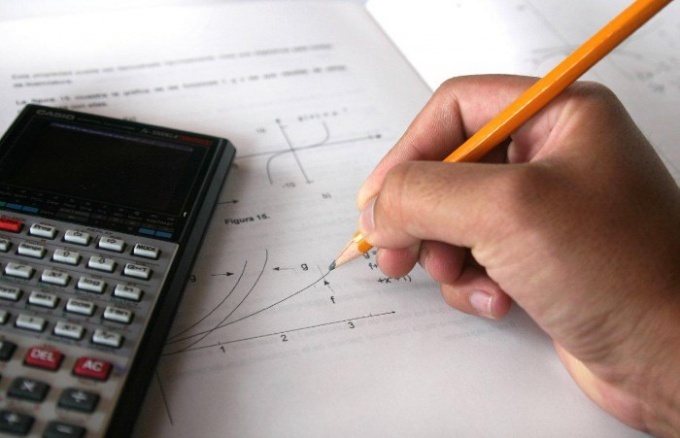 The process of determining the derivative of a function is called differentiation. A common way to represent and determine through the theory of limits, although it emerged later, of the differential calculus. 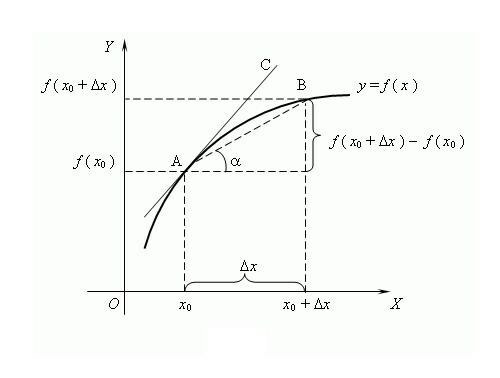 According to this theory, the derivative is the limit of the ratio of the increment function to increment of argument, if such a limit exists, provided that the argument tends to zero. It is believed that the term "derivative" used the famous Russian mathematician V. I. Viskovatov.To find the derivative of the function f at the point x, determine the value of this function at the point x and the point x+Δx, where Δx is the increment of the argument X. to Find the increment of the function y = f(x+Δx) – f(x). To write the derivative using the limit of the ratio f’ = lim(f(x+Δx) – f(x))/Δx, calculate when Δx → 0. It is common to denote the derivative sign apostrophe "'" on a differentiable function. Single apostrophe – the first derivative, two second derivative of highest order is set to corresponding digit, for example, f^(n) is a derived n-th order, where n is an integer ≥ 0. Derivative of zero order is itself a differentiable function.To facilitate the differentiation of complex functions were developed the rules of differentiation: C’ = 0, where C – constant; x’ = 1; (f + g)’ = f’ + g’; (C*f)’ = C*f’ etc. For N-fold differentiation applies the formula of Leibniz: (f*g)^(n) = Σ C(n)^k*f^(n-k)*g^k where C(n)^k – binomial coefficients.Some properties of the derivative: 1) If the function is differentiable on some interval, then it is continuous on this interval;2) By Lemma Farm: if the function has a local extremum (minimum/maximum) at the point x, then f(x) = 0;3) different functions may have the same derivatives.The geometric meaning of derivative, if the function f has a finite derivative at x, then the value of this derivative will be equal to the tangent of the angle of inclination of the tangent to the function f at this point.Physical meaning of the derivative: the first derivative function of the motion of the body velocity, the second derivative is the instantaneous acceleration. Function argument – time.The economic meaning of the derivative: the first derivative of the volume of goods produced in a certain time is labor productivity. A function can be differentiable for all values of the argument, can have a derivative only at certain intervals or does not have a derivative. But if the function has a derivative at some point is always a number, not a mathematical expression. If a function Y of one argument x is given in the form of the dependence Y = F (x), define its first derivative Y' = F'(x) using rules of differentiation. To find the derivative of a function at a certain point h, pre-consider the range of permissible argument values. If h belongs to this region, then substitute the value h into the expression F'(x) and determine the value Y'. Geometrically derivative of a function at point is defined as the tangent of the angle between the positive direction of x-axis and the tangent to the graph of the function at the tangent point. A tangent is a straight line, and equation of a line in General form is written as y=kx +a. The touch point g common to the two graphs of a function and a tangent. Therefore, Y(h) = y(h). The coefficient k is the value of the derivative at a given point Y' (h). If the investigated function is specified graphically on the coordinate plane, to find the derivative of the function at the desired point guide through this point is tangent to the graph of the function. The tangent is the limiting position of the secant at the maximum rapprochement of the points of intersection of the secant with the graph of the given function. It is known that the tangent is perpendicular to the radius of curvature of the graph at the tangent point. In the absence of other source data knowledge of the properties of the tangent will help to draw it with greater certainty. Cut a tangent from the tangent point of the graph to the intersection with the abscissa axis forms the hypotenuse of a right triangle. One of the side — ordinate of a given point, the other leg of the x-axis from the point of intersection with the tangent to the projection of the investigated points on the axis OX. The tangent of the angle of inclination of the tangent to the axis OX is defined as the ratio of the opposite leg (the ordinates of the touch point) to the surrounding. The resulting number is the desired value of the derivative of a function at a given point.